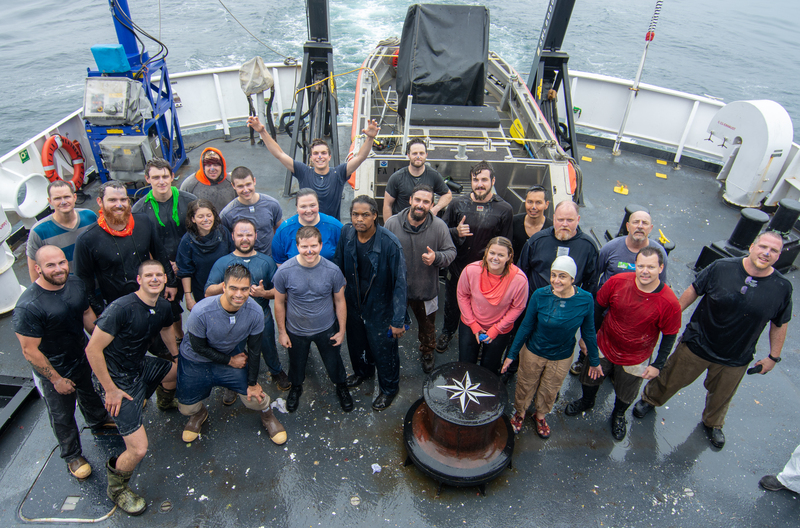 Despite a few setbacks, the crew of NOAA Ship Fairweather worked diligently to complete as much surveying as possible around Point Hope during this leg of the mission. Three small boats were sent out last Saturday, July 14th to each survey part of a “sheet”. 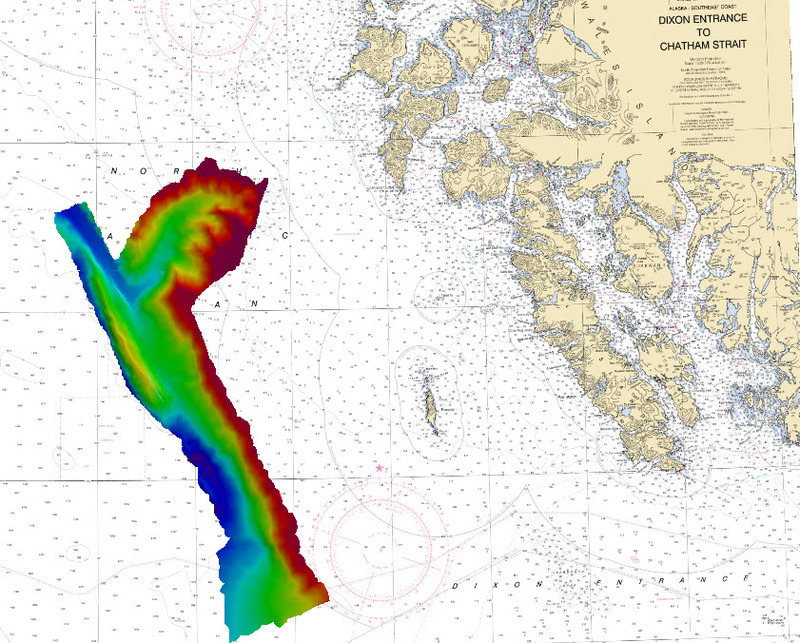 A sheet is an area of ocean assigned to a hydrographer to survey and process into a bathymetric map. A bathymetric map is the colorful map produced from survey data that shows ocean depth using colors of the rainbow from red (shallow) to blue (deep). Ultimately, that sheet will be added to a nautical chart. Hydrographer Toshi Wozumi kindly showed me the progress that the ship has made towards the Point Hope survey mission below. The soundings were conducted with “set line spacing” of between 100m and 1,000m between each line in order to cover a satisfactory amount of ground in a feasible timeframe. When a more detailed map is necessary, there will be no empty space between lines and this is known as “full coverage”. Point Hope is such a unique little piece of land. All of the light blue you see on the map above is actually fresh water from inland. Skinny slices of land separate the salty Arctic water from the fresh water. Hydrographer Christina Belton told me that this area experiences a lot of erosion. In the area we surveyed, you can see an unusually straight line between the deep blue-colored seafloor and the relatively shoal yellow- to green-colored seafloor (shoal is a synonym for shallow, but of the two it is the more common word used by hydrographers). This distinct line is a sand bar where sediment collects from erosion and water currents. I am really interested to see how the bathymetric map develops as the season goes on! Hydrographers are expecting this survey to be very flat and unexciting, but you never know what will show up! The tiny little polygon at the bottom left of the picture above is a section of a PARS corridor. PARS is an acronym that stands for Port Access Route Studies, and these studies are initiated by the US Coast Guard when an area may be in need of routing changes or new designated routes for a number of different reasons. According to the US Coast Guard, the Eastern Bering Sea is a relatively shallow sea with depths ranging from 20 – 250 feet. 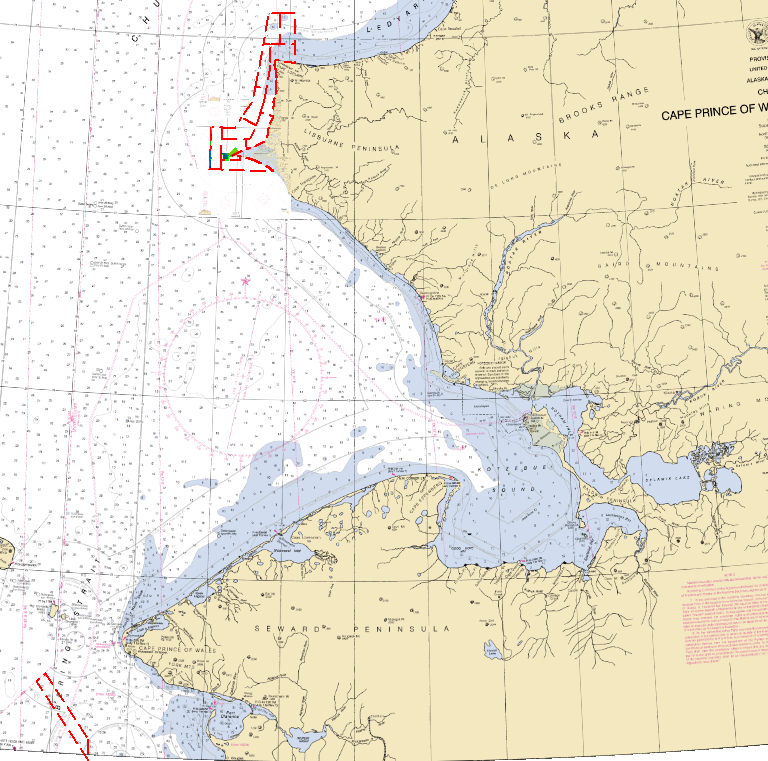 This in combination with outdated nautical charts containing sparse data points can make for dangerous conditions for mariners trying to navigate in and around the Bering Sea. In addition Arctic sea ice is retreating more and more each year, and there is a growing interest in travel through the Northwest Passage, formerly covered in sea ice year round. I have heard that a cruise ship will soon travel the Northwest Passage, and tickets start at $37,000 per person. Any takers? NOAA Ship Fairweather was tasked with surveying a small section of the PARS corridor. We worked on this project during our return trip to Nome. A bathymetric map was not prepared by the time I left the ship, so I was not able to see the data. However, this data will be a very important addition to the US Coast Guard’s maps. You may notice on the map of the proposed survey sheets that the northern border of the polygon follows a longer line. This is the International Date Line and also the border between the US and Russia. NOAA Ship Fairweather had to take special precautions to ensure we did not enter international waters without permission, so we ran a couple of soundings the short way on the edge of the polygon before changing our lines to go the long way. The short lines gave us room to turn the ship around without entering Russian waters. If you have ever mowed your lawn, running lines on the ship is just like mowing lines on your grass. When you get to the end of your yard, you need room to turn the lawn mower around before mowing in the opposite direction. In fact, hydrographers informally refer to the act of collecting data with the MBES as “mowing the lawn”! NOAA Ship Fairweather will continue to collect data in the Point Hope region for a couple more months. The ship is projected to use 53 days at sea to finish the project. However, this time of year can be difficult for navigating the Bering Sea due to frequent storms. This work requires patience and flexibility, as I witnessed during my time on the ship. In the end, the maps and nautical charts they create will be increasingly valuable as more marine traffic will use the Arctic Ocean during the months when there is no sea ice. This morning we docked the ship in Nome. It was a bittersweet feeling to step on land once again. I grew to enjoy waking up each morning with water in all directions. The light rocking motion in the evening helped me sleep like a baby! I learned a lot of new information in a short period of time. I also made some new friends among the Fairweather crew and the visitors. Together we endured the 12′ seas of Tuesday’s storm in addition to the Blue Nose initiation! The initiation will forever remain a Navy (and NOAA Corps) secret, but I suppose I can show you the after picture! The ceremony itself was quite a messy ordeal, so we had to rinse off before going back inside the ship. What’s the best way to rinse off at sea? You guessed it! Ice cold Arctic sea water! Not to worry though; safety was the first priority and there were no cases of hypothermia onboard. Upon completing the initiation, the 24 crew members below metamorphosed from slimy wogs to polar bears! The remaining 20 or so crew members had previously earned the name of polar bear. 24 soaking wet but proud Polar Bears! One thing I learned while aboard NOAA Ship Fairweather is that living and working in the same place with the same people is a unique experience. Your work time and off time are confined to the same spaces. You are always around the same 40 – 50 people. In addition, working in remote areas means fewer modern conveniences like TV and cell phone service. You can’t go out to eat or go shopping until you arrive back in port. It’s not for everyone. What I can say though is that not a single person aboard the ship complained about any of these things! Everyone onboard has learned to adapt to the unique challenges and benefits of their workplace. There are many things to enjoy too! It was so nice not having to cook or do dishes for two weeks! You get to live more simply, which means fewer things to worry about day to day, like getting to work on time and getting to the gym/grocery store/post office/anywhere before it closes or gets too crowded. It’s also a fun place to be! Events like the blue nose initiation boost morale and give everyone fun things to plan and look forward to. I thoroughly enjoyed the mindset shift and gained an appreciation for this kind of work. I will also miss it! The most recent soundings for the coastal area north of Point Hope were taken in the 1800s when Russia owned Alaska. They were measured with lead lines, and as you can see in the Point Hope nautical chart, there was a large distance between each measurement. be able to pass a test for illegal drug use. US Coast Guard (2017). Appendix B – Hydrographic Quality Analysis. Bering Sea PARS. https://www.navcen.uscg.gov/pdf/PARS/Bering_Strait_PARS_Appendix_B.pdf. NOAA Ship Fairweather has a variety of assignments in different parts of the west coast each year, mostly in Alaska. They also work with many different organizations. 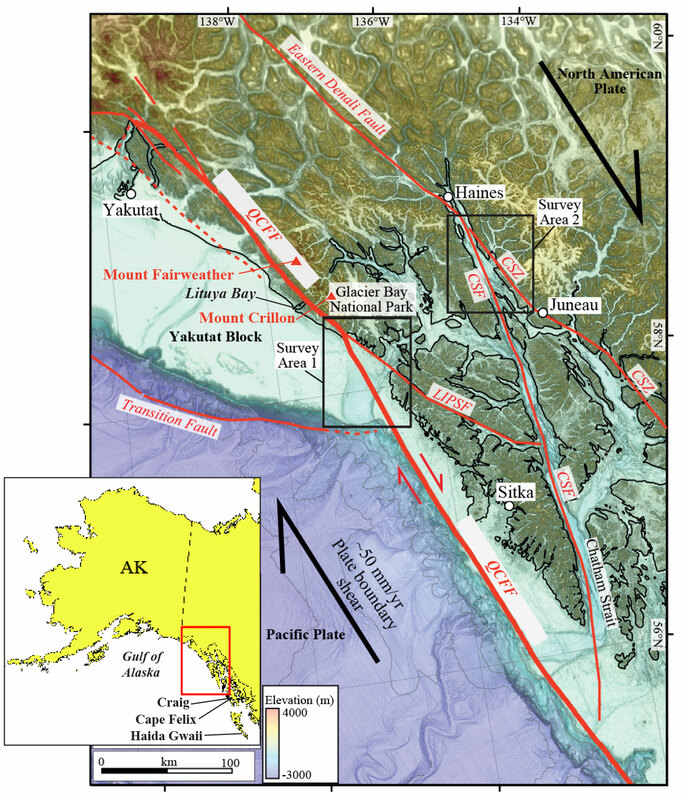 In April of 2018, the US Geological Survey, or USGS, hired the ship to complete the last part of the survey of a fault line, the Queen Charlotte Fault, which lies west of Prince of Wales Island, Alaska. This was a joint venture between the US and Canada because it is the source of frequent and sometimes hazardous earthquakes. The Queen Charlotte Fault lies between the North American Plate and the Pacific Plate. The North American Plate is made of continental crust, and the Pacific Plate is made of oceanic crust. The two plates slide past one another, so the plate boundary is known as a transform, or strike slip, fault. The image to the right came from the USGS. Notice the two black arrows showing the directions of the North American and Pacific plates. Strike slip faults, such as this one, have the potential to produce damaging earthquakes. The San Andreas Fault in California is another example of a strike slip fault. The Queen Charlotte Fault moves relatively fast, with an average rate of 50 mm/year as shown in the photo. The USGS explains the Queen Charlotte fault beautifully in this article. The image below was created after hydrographers on NOAA Ship Fairweather processed the data from their survey in April. The colors show relative depth across the fault, with red being the shoalest areas and blue being the deepest areas. In the top right section, you can see Noyes Canyon. There are many finger-shaped projections, which are result from sediment runoff. Notice that the color scheme in this area does not have much orange or yellow; it basically goes from red to green. If you were to look at this map in 3-D, you would see in those areas that the sea floor dramatically drops hundreds of meters in a very short distance. It is also worth noting what can be found in the remainder of this image. When NOAA finishes their survey, two different products are formed. The first is the colored map, which you see to the far left of the image. This is useful for anyone interested in the scientific components of the area. 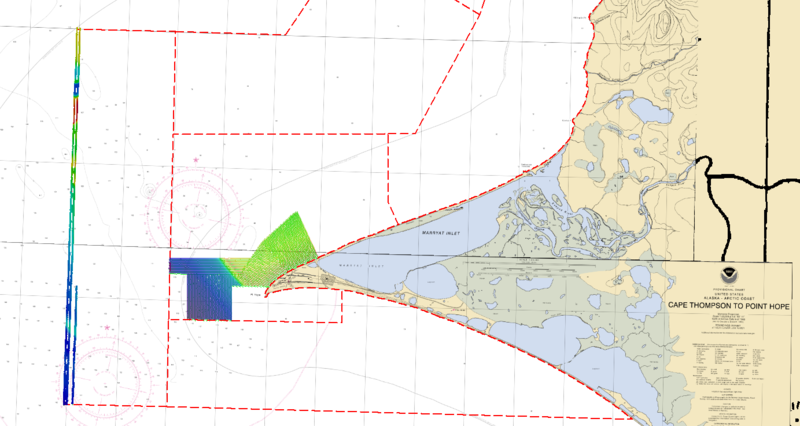 Mariners need the information as well, but a colored schematic is less useful for marine navigation, so nautical charts are produced (or updated) for their use. A nautical chart looks just like the remainder of this image. Small numbers scattered all over the white part of the map (ie – the water) show the depth in that area. The depth can be given in fathoms, meters, or feet, so it is important to find the map’s key. 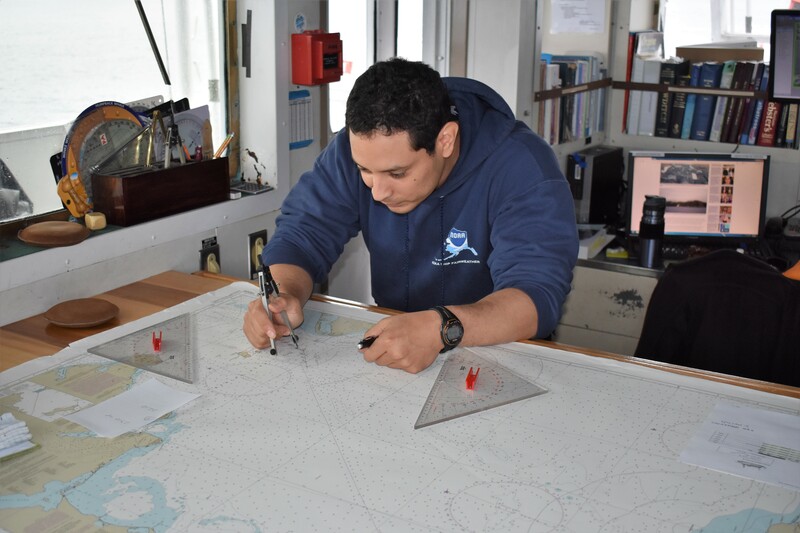 The purpose of the charts is to communicate to mariners the most navigable areas and the places or obstacles that should be avoided. The nautical charts usually have contour lines as well, which give a better picture of the slope of the sea floor and group areas of similar depth together. The photo above is a closer view of the Queen Charlotte Fault. Can you see the fault? If you cannot see it, look at the line that begins in the bottom center of the photo and reaches up and to the left. Do you see it now? On the left side of the fault lies the Pacific Plate, and on the right side lies the North American Plate. If you look even closer, you might find evidence of the plates sliding past each other. The areas that resemble rivers are actually places where sediment runoff imprinted the sea floor. If you observe closely, you can see that some of these runoff areas are shifted at the location of the fault. Scientists can measure the distance between each segment to determine that average rate of movement at this fault line. I also wanted to briefly mention another small side project we took on during this leg. A tide buoy was installed near Cape Lisburne, which is north of Point Hope. The buoys are equipped with technology to read and communicate the tidal wave heights. This helps hydrographers accurately determine the distance from the sea surface to the sea floor. The buoy will remain at its station until the end of the survey season, at which time it will be returned to the ship. The tide buoy was successfully released and will remain in the Arctic Ocean until late summer or early fall. Northwest Alaska may not be a breathtaking as Southeast Alaska, but it has sure been an interesting trip! It amazes me that small communities of people inhabit towns such as Nome, Point Hope, and Barrow (which is about as far north as one can travel in Alaska) and endure bone-chilling winter temperatures, overpriced groceries, and little to no ground transportation to other cities. Groceries and restaurant meals are expensive because of the efforts that take place to transport the food. During my first day in Nome, I went to a restaurant called the Polar Cafe and paid $16 for an omelette! Although the omelette was delicious, I will not be eating another during my last day in Nome on Friday. It is simply too expensive to justify paying that much money. I also ventured to the local grocery store in hopes of buying some Ginger Ale for the trip. Consuming ginger in almost any form can help soothe stomach aches and relieve seasickness. Unfortunately ginger ale was only available in a 12-pack that happened to be on sale for $11.99. I decided to leave it on the shelf. Luckily the ship store has ginger ale available for purchase! The ship store is also a great place to go when your sweet tooth is calling! 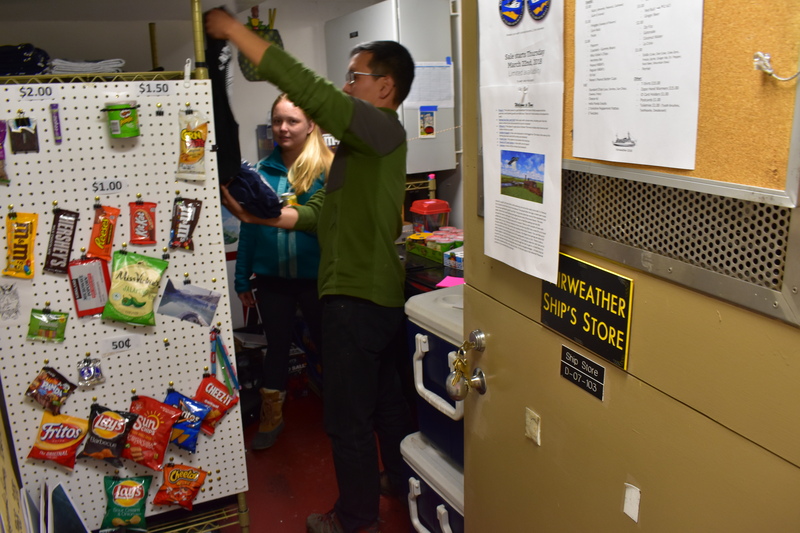 The Ship Store opens most nights for personnel to buy soda, candy, or even t-shirts! The Queen Charlotte fault was the source of Canada’s largest recorded earthquake! The earthquake occurred in 1949 and had a magnitude of 8.1! How does a personal flotation device (PFD) keep a person from sinking? When something is less dense than water it floats, and when it is more dense than water it sinks. Something with the same density as water will sit at the surface so that it lies about equal to the water line (picture yourself laying flat on the surface of a lake). Your body is over 50% water, so the density of your body is very close to the density of water and you naturally “half float”. A PFD, on the other hand, is made up of materials which have a lower density than water and they always float completely above water. When you wear a PFD, your body’s total density is a combination of your density and the PFD’s density. Therefore, the total density becomes less than the density of water, and you float! Danny, et al. (2016). Investigating the Offshore Queen Charlotte-Fairweather Fault System in Southeastern Alaska and its Potential to Produce Earthquakes, Tsunamis, and Submarine Landslides. USGS Soundwaves Monthly Newsletter. https://soundwaves.usgs.gov/2016/01/. Torresan, L (2018). Earthquake Hazards in Southeast Alaska. USGS Pacific Coastal and Marine Science Center. https://walrus.wr.usgs.gov/geohazards/sealaska.html. I was in my stateroom on Friday afternoon when I heard one continuous alarm sound, followed by an announcement that white smoke had been detected on board. My first thought was Oh no! What’s wrong with the engine now??? As I walked out of my room, I noticed smoke permeating through the halls near the ceiling. My muster station was the forward mess, so I walked there to meet up with my group. Two PICs (people in charge) had already laid out a map of the ship, and they were assigning pairs of people to search different sections of the ship looking for smoke and/or hot spots on doors or walls. Each “runner” group took a radio and reported their findings, and the results were written on the map. I was runner group 4 with an intern named Paul, and we were assigned the E level just below the bridge. We saw a small amount of smoke but no hot spots. One runner group opened an escape hatch to the fan room to find smoke EVERYWHERE. After finding the source of the fire, it was put out as quickly as possible and the smoke ventilated out of the ship. If you haven’t guessed it yet, this was our first fire drill. Safety is always the first priority on all NOAA vessels. Working on a ship is much different than working on land. In the event of an emergency, everyone on board has to be prepared to be a first responder. If one serious accident happens, it could affect all 45 people on board. To ensure emergency preparedness, drills take place on a regular basis. Each drill is treated as though the emergency were happening in real life. Fire drills and abandon ship drills take place weekly, and man overboard drills and hazardous materials drills take place every three months. An announcement to abandon ship happens as a last resort if there is no possible way to save the ship. If this were to happen, we would hear seven or more bursts of the alarm followed by an announcement. We would then grab our immersion suit and PFD (personal flotation device) as quickly as possible and meet at our muster stations. My muster station is on the port (left) side of the ship at fire station 24. There are life rafts on each side of the ship that can be deployed into the water. Right now, the water in the Arctic Ocean is a chilly 9° C. To protect ourselves from hypothermia, we must don an immersion suit within 60 seconds of arriving at our station. New people to the ship must practice this during our first few days on board. In addition to drills, an operational risk assessment (or GAR score) is calculated for the mission each day. GAR stands for Green, Amber, or Red, and it determines whether the mission is safe to pursue that day. The GAR score consists of the following sections: resources, environment, team selection, fitness, weather, and complexity. Each section is given a rating of 1 – 10, with 1 being the best and 10 being the worst. Many of the sections are variable depending on the day, so sometimes a mission will be delayed until the weather improves, and other times assigning different personnel to the task may be enough to make the mission safe. The total score is the sum of the six sections. If the score is 45 or above (red zone), then the mission will not happen that day. If the score is between 24 and 44 (amber zone), it means extra caution is advised, and a low GAR score of 0 – 23 is green. The best case scenario is for the mission to be in the green zone. Some other examples of safe practices on board NOAA Ship Fairweather are detailed below. I’m learning what it truly means to be flexible during my time with NOAA Ship Fairweather. Weather can make or break a day of surveying on the sea. The water experiences surface waves from both the wind and swell. Swells are the large waves that originate elsewhere and have a definite direction whereas the surface waves are caused by wind and are much smaller. The surface waves in combination with the swell produce a total wave height, and the NOAA Corps looks at the total wave height when deciding the plan of the day. Unfortunately, waves of up to 14′ are predicted in the Point Hope region this week, which will make it incredibly difficult to launch the small boats. Not only do the large waves create hazardous conditions on the boat, they make it harder to acquire good soundings with the MBES. If the data collected will be of poor quality, it is better to delay the mission and wait for better conditions. The poor weather in combination with the mechanical delay we experienced during the first week of the leg has made it difficult to collect very much data around Point Hope. Not only do the large waves slow down the ship’s data collection, they make me queasy! I felt lucky coming in to the Arctic Ocean on Friday because the sea was calm and beautiful! It was almost eerily quiet. The most amazing part was that the horizon seemed to disappear as the sky and the ocean gently blurred into one. The serenity was short-lived however, and taking the small boats out Saturday morning was quite the adventure! I am so glad I brought motion sickness medication with me! Did you know NOAA Ship Fairweather weights 1,591 tons? Since one ton is the same as 2,000 pounds, the ship weighs 3,182,000 pounds! The ship stays afloat, so that means the buoyant force it experiences is equal and opposite to its weight. If the buoyant force were any less, the ship would sink! How many nautical names can you think of for rooms/locations on the ship, and what would their equivalent name be on land? Do you know of any that I missed? Feel free to answer in the comments! As you may or may not know, NOAA stands for National Oceanic and Atmospheric Administration. NOAA is a branch of the Chamber of Commerce and gets funded by the federal government to undergo many important tasks. Their mission is “to understand and predict changes in climate, weather, oceans, and coasts, to share that knowledge and information with others, and to conserve and manage coastal and marine ecosystems and resources.” (http://www.noaa.gov/about-our-agency) NOAA Ship Fairweather’s role in that mission is to measure and understand changes in the sea floor to allow for safe navigation in our world’s oceans and seas. Two NOAA Corps Members (LT Moulton top, ENS Siegenthaler bottom) prepare to dive under the ship to clean sound-measuring instruments. Many different career specialties are required to keep the ship running smoothly. The NOAA Commissioned Officer Corps operates ships, conducts dive operations, and manages the hydrographic research projects assigned to the ship. They make up one of the seven uniformed services of the United States: Army, Navy, Marine Corps, Airforce, Coast Guard, NOAA Commissioned Officer Corps, and Public Health Service. 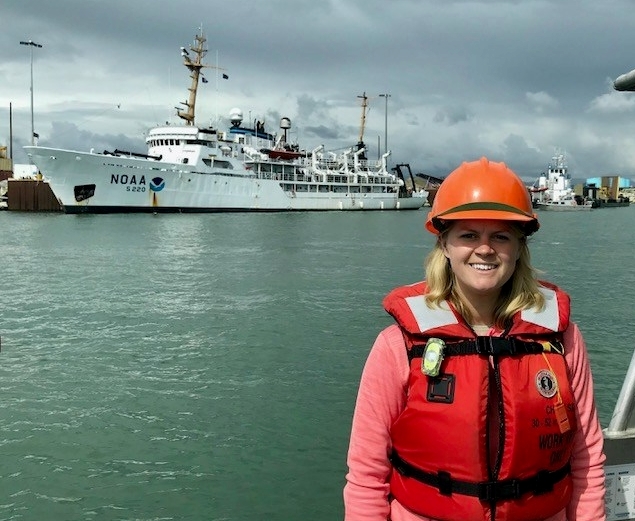 All NOAA Corps members have a bachelors degree or higher in a STEM field; some of the degrees earned by Corps members on NOAA Ship Fairweather are marine biology, environmental science, wildlife ecology, chemistry, physics, and math. The Survey Department is comprised of scientists who exclusively focus on the hydrographic mission. They operate and monitor instruments, collect and process data, and deploy and recover survey equipment. Data collection sometimes takes place on the ship and sometimes on small boats. They have to be proficient with advanced hydrographic software and with combining multiple sources of data into one. I have even seen members of the Survey Team conducting dive operations, so being dive-certified is very useful for the job. 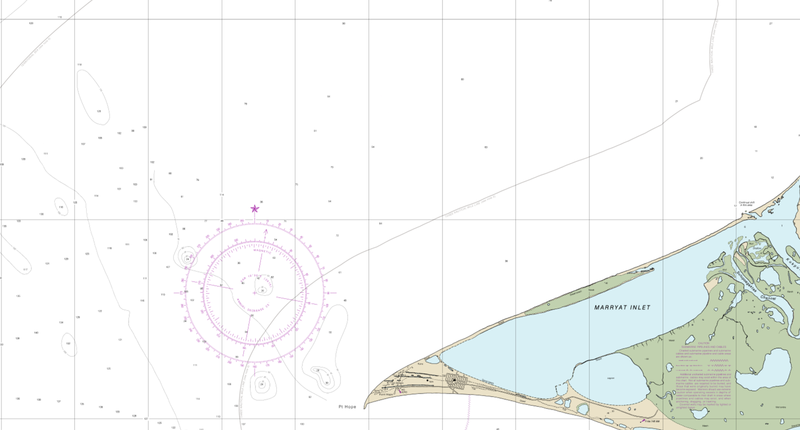 The Survey team makes nautical charts used by many different industries worldwide. Fresh fruits and vegetables are served at every meal, and there is always a new kind of meat to try! This was my first time trying lamb! The Deck Crew consists of Able-Bodied Seamen (ABs) and General Vessel Assistants (GVAs). ABs and GVAs must be knowledgeable and capable of completing many types of work. They perform general maintenance, infrastructure repair, sanitation, and upkeep of the ship. They also assist in emergency operations and the launch and recovery of small boats. Another department is the Steward Team who cook our food, clean the mess (dining area) and galley (kitchen), and wash dishes in the scullery (dish room). They often work 12 hour days, and their work is needed 7 days a week. So far, they have planned nothing but delicious meals for us all to enjoy (especially the desserts!). 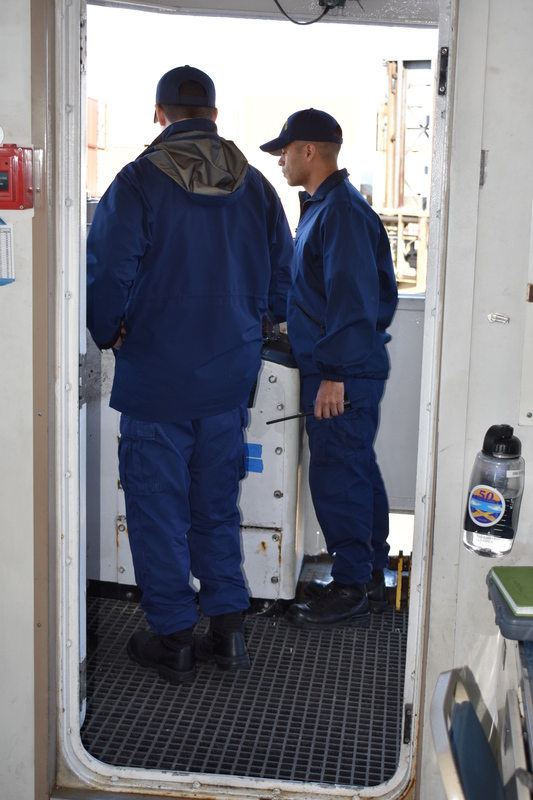 Engineers keep the ship functioning well by inspecting, maintaining, and repairing all of the ship systems (water, sewage, power, heating, etc.). They must be familiar with a vast array of equipment in order to do their job well! We also have one medical professional, a Physician’s Assistant, who works in the sick bay to treat anyone who may be ill or injured and assist with emergency operations. Visitors frequent the ship as well. Currently, there is a meteorologist from the National Weather Service and an intern from Loyola University Chicago on board. Specialists may come aboard for a few days or a whole trip depending on what kind of work they are doing. As you can see, working aboard a ship is not limited to ocean-related careers. You can find positions for many different interests, and all of these people get to work in an environment that most others don’t get to experience! In my previous blog, I promised to include a picture of a nautical chart developed by the multibeam echosounder (MBES) on NOAA Ship Fairweather and its small boats. The photo below shows progress on a survey that began in April 2018. As you can see by the colored boxes that not all of the surveying is yet complete. NOAA Ship Fairweather has experienced a fairly difficult season with some mechanical setbacks, but they use every minute possible when underway, sometimes working 24 hours per day in designated shifts to finish a job. Every team on this ship does a great job working together and adjusting to the unexpected! This sketch was completed by staff on NOAA Ship Fairweather in May 2018 to replace surveys that were last updated as long ago as 1916. The numbers around the chart show depth in fathoms from previous surveys (the survey is in meters). Before echosounding technology was developed, surveys were often completed using lead lines. Lead lines are exactly what they sound like; there is a long rope with a block of lead attached to the end. It is slowly lowered through the water column until it hits the sea floor. The line is then pulled back up and the water depth is measured. 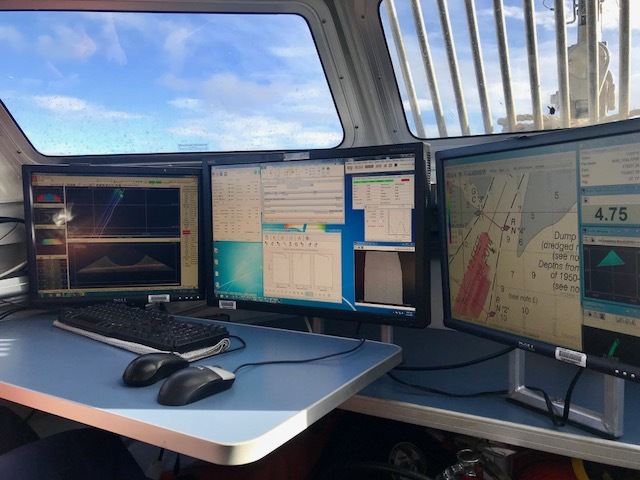 This form of surveying gives mariners some idea of what the sea floor looks like, but you can see that current technology allows for a fuller coverage map of the area. This is helpful because fishing and transportation ships need to know what obstacles they may encounter below the surface of the water while traveling. 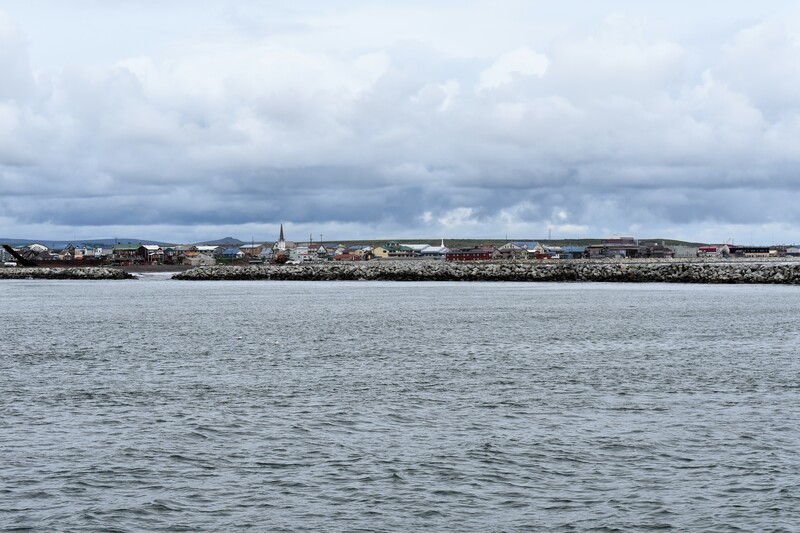 Our ship is very close to Nome’s town center, and there are a few interesting things to do and see! Nome is the ending point of the famous Iditarod Sled Dog Race. You can find photos all over town of previous competitors in addition to standing under the arc of the finish line in the middle of town. There is a museum in town, the Carrie McLain Museum, that showcases the beautiful history of Nome and has over 15,000 artifacts. It’s also very easy to access some beautiful hiking. I hiked Anvil Mountain yesterday with a couple other friends on the ship. During our hike, we encountered two separate herd of Muskox. They are large, gentle creatures that call the Arctic regions their home. You can learn more information on this National Geographic website. We made sure to keep a safe distance away because both herds had young, and we did not want them to feel threatened in our presence. After a few extra days in Nome, I am happy to announce that we began our 22 hour journey to Point Hope at 10:00 this morning! The survey work will start once we reach our final destination. If all goes well, we will cross the Arctic Circle tonight. There is a history in the Navy of awarding sailors unofficial certificates for crossing navigation lines at sea. For example, sailors earn the “Shellback” when they cross the Equator by boat. When we cross the Arctic Circle, many of us onboard will earn the “Blue Nose”. You can see other unofficial certificates that are offered around the globe on this Navy website. I took this picture at 4:30am on July 13. Sunrise was at 5:03am. Even though the sun technically “sets”, it doesn’t get dark at night during this time of year. In January of 1925, the Nome hospital realized their treatment serum for the deadly diptheria infection was expired, and the winter weather was too harsh to send a replacement via plane. People began to get infected, and they were in a state of emergency! If treatment didn’t arrive soon, the entire town could acquire the disease. Luckily, over twenty sled dog mushers volunteered to take part in a relay on the Iditarod Trail, spanning over 650 miles of wilderness. The final sled dog team was led by 3-year old Balto, a siberian husky. Does this story sound familiar? In 1995, a cartoon movie was made and given the name “Balto” in honor of the brave, rookie sled dog who led his team into Nome on February 2, 1925 to save the town! How many nautical names can you think of for rooms/locations on the ship, and what would their equivalent name be on land? (For example: the “scullery” = “dish washer”). Hint: reread the “Science and Technology” section of this blog for a few answers! Feel free to leave your answer as a comment! If a CTD determined that the speed of sound in an area was 1,504 m/s and the time it took for the sound wave to travel from the ship’s transmitter to receiver was 0.08 seconds, how deep was the water in that specific area? The center of town features a sculpture of a gold pan because Nome is historically known for gold panning and dredging. 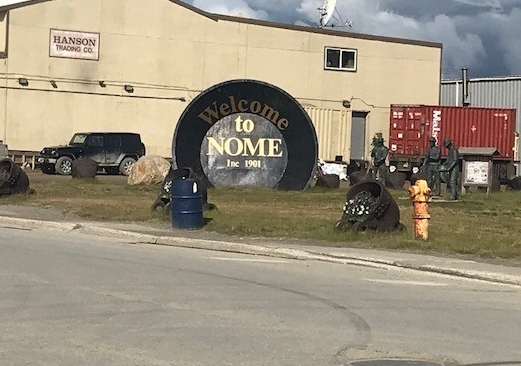 occurrence in Nome. Usually, the precipitation falls as more of a light drizzle in the summer, so the accumulation over the course of a year is very small. I am here in Nome to join NOAA Ship Fairweather on a Hydrographic Survey of the vicinity of Point Hope, Alaska. Nome is the northernmost city in Alaska with a deep enough draft dock and facilities (such as sewage disposal and fresh water) for a ship. Therefore, we will start and end our trip in Nome. The ship has been experiencing some technical difficulties, so we were not able to go underway on our scheduled day of July 9. 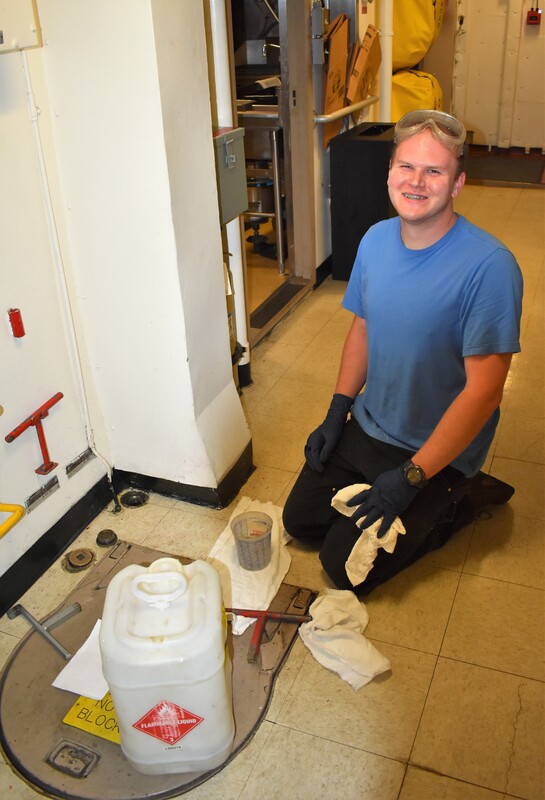 Over the weekend, engineers discovered a leak in the exhaust from one of the ship’s engines. Left untreated, black smoke could escape into the ship and personnel could be exposed to the unhealthy fumes. As of today, the exhaust pipe has been fixed, but there are a few parts that need to be shipped to Nome to finish the job. Hopefully NOAA Ship Fairweather will be underway later this week. 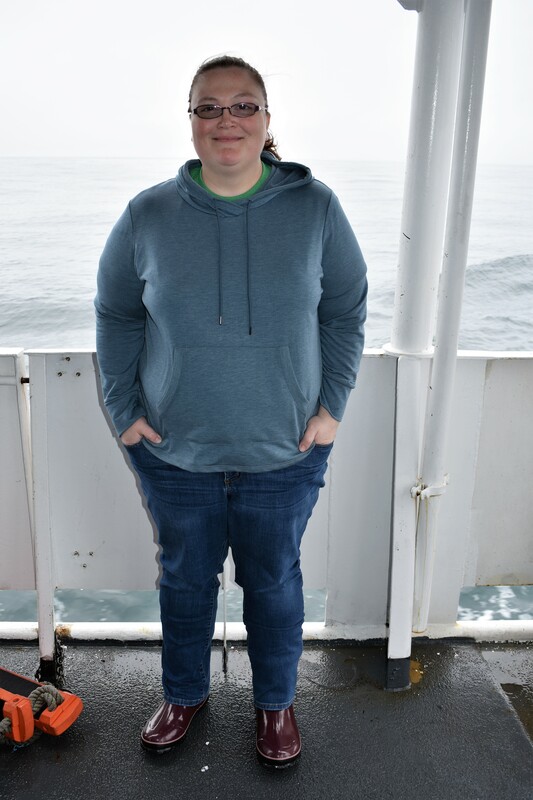 Here I am aboard one of the small boats with NOAA Ship Fairweather in Background at the Nome Harbor. Once we are underway, the trip to Point Hope will take approximately 22 hours. That means we must reserve a full day on each end of the leg (another name for the trip) for travel. In order to maximize our limited time near Point Hope, NOAA Ship Fairweather will deploy up to four 28′ boats to work at the same time. There are also enough personnel onboard to allow data to be collected on the small boats for up to 24 hours per day. Two of the four 28′ boats are shown below. 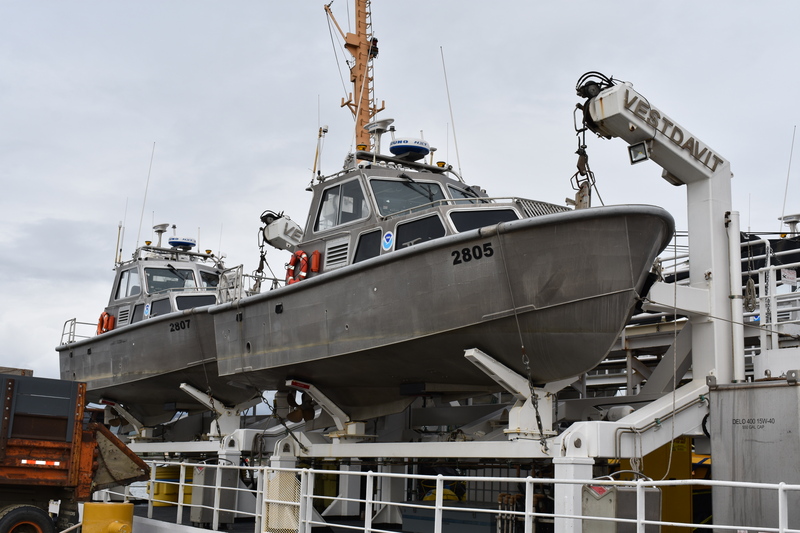 Two 28′ boats with hydrographic instruments can be found on each side of NOAA Ship Fairweather. So what are these boats all doing anyways? As previously mentioned, NOAA Ship Fairweather and its small boats are designed for hydrographic research. “Hydro” is a prefix meaning “water”, and “graph” is a root word meaning “to write”. The boats will map the sea floor (i.e. – “write” about what is under the water) and any of its contents with sonar devices. Sonar is an acronym that stands for SOund Navigation And Ranging. The main sonar device used on this ship is a multibeam echosounder (MBES for short), which can be found on the underside of the ship as seen below. Sound waves are emitted from the front of the device, known as the transmitter. The sound waves travel through the water column, bounce off the sea floor, and then get picked up by a receiver adjacent to the transmitter. There is a lot of math involved both before and after sound wave data is collected! 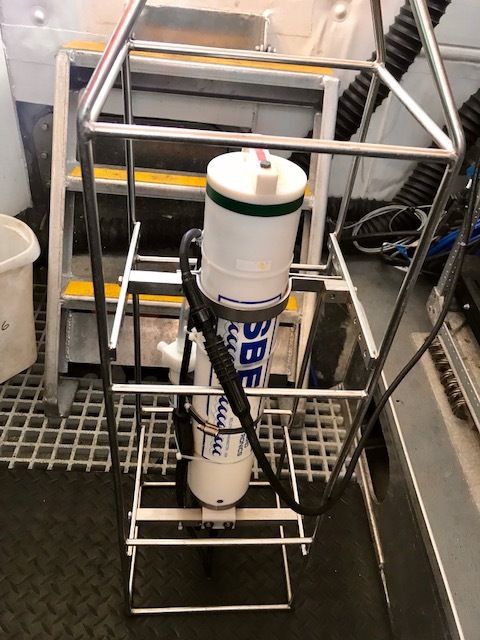 The photo below is a CTD instrument, which stands for conductivity, temperature, and depth. Conductivity is a measure of how well an object conducts electricity. This instrument is lowered through the water column, collecting data on all three parameters listed above. The speed of sound varies based on conductivity and temperature, so the sonar data can be adjusted based on the results. For each individual data point collected along the sea floor, the actual speed of sound is multiplied by half of the time it took the sound wave to travel from transmitter to receiver. Using the equation distance = rate x time, one can find the distance (i.e. – depth) of each point along the sea floor. Put a bunch of those results together, and you begin to see a map! Many screens are needed to put all of the data together into an accurate sea floor map. Sea floor maps use color to show different depths. The most shallow areas are colored with red, while the deepest areas are colored with blue. The remaining colors of the rainbow form a spectrum that allows us to see slopes. Today, we took a small boat out and surveyed the harbor where NOAA Ship Fairweather is docked. The harbor was very shallow, so every large rock in the harbor showed up as red on the map. The deeper areas showed up as blue. Hence my blog title! In my next blog, I will include pictures of maps that have recently been completed! Stay tuned! addition to a couple of rocks I thought were quite pretty! Sea glass is made from containers, bottles, and other glass objects that end up in the ocean. 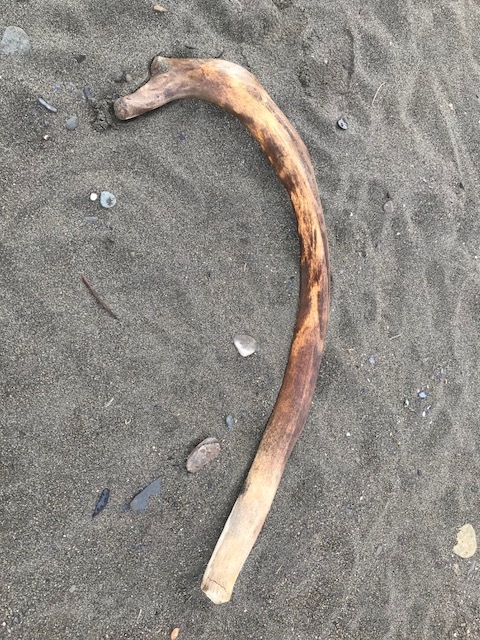 Over time, these objects break into smaller pieces, and the sandy and/or rocky sea floor erodes them. 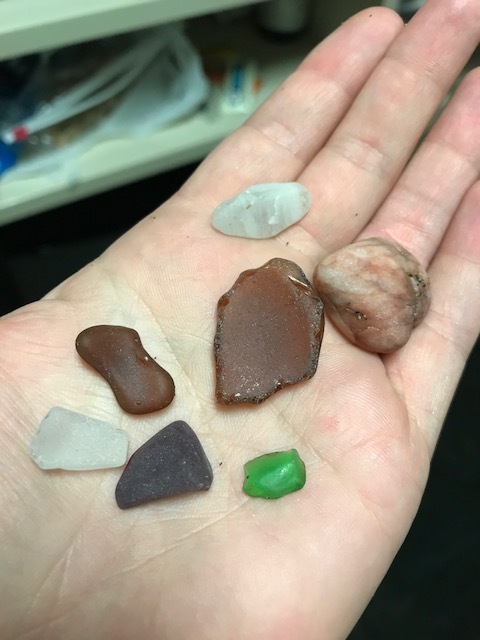 By the time they reach the beach, the pieces of glass have smooth edges and a translucent color. They are fun to collect as they come in many different colors, shapes, and sizes! Ocean water has a high conductivity, or ability to conduct electricity, because of all of the dissolved salts in sea water. The ions that form from dissolved salts cause ocean water to be about 1,000,000 times more conductive than fresh water! If a CTD determined that the speed of sound in an area was 1,504 m/s and the time it took for the sound wave to travel from the ship’s transmitter to receiver was 0.08 seconds, how deep was the water in that specific area? Make sure to use proper units, and remember that the total time is two ways and not just one way!